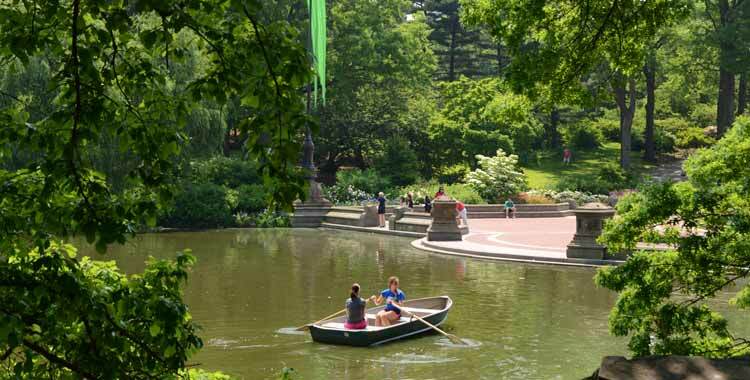 Boating on the Lake, Central Park's second largest water body, is a great way to spend a lazy summer afternoon in the Park. Visitors can take in the water views and get a closer look at the Lake’s historic boat landings, which the Conservancy recently restored to their original designs. Row boating on the Lake is available April through October, weather permitting. Row boats and gondolas can be rented at the Loeb Boathouse daily, 10:00 am until dusk. East Side of the Park between 74th and 75th Streets.